Yue Xin intelligent high performance wireless connectivity platform --ESCP SOC, designers bring the Gospel to the mobile platform, it At the lowest cost to provide maximum usability for WiFi capabilities embedded in other systems offer unlimited possibilities. ESP8266 specifically for mobile devices, wearable electronics and networking applications design and make the machine to achieve the lowest energy consumption, together with several other patented technology. This energy-efficient construction in three modes: active mode, sleep mode and deep sleep mode type. When ESP8266 using high-end power management technology and logic systems to reduce non-essential functions of the power conversion regulate sleep patterns and work modes, in sleep mode, it consumes less than the current 12uA, is connected, it consumes less power to 1.0mW (DTIM = 3) or 0.5mW (DTIM = 10). Sleep mode, only calibrated real-time clock and watchdog in working condition. Real-time clock can be programmed to wake ESP8266 within a specific period of time. Through programming, ESP8266 will automatically wake up when detected certain to happen. ESP8266 automatic wake-up in the shortest time, this feature can be applied to the SOC for mobile devices, so before you turn Wi- Fi SOC are in a low-power standby mode. To meet the power requirements of mobile devices and wearable electronics products, ESP8266 at close range when the PA output power can be reduced through software programming to reduce overall power consumption in order to adapt to different applications. ESP8266 integrates the most critical components on the board, including power management components, TR switch, RF balun, a peak power of + 25dBm of PA, therefore, ESP8266 only guarantee the lowest BOM cost, and easy to be embedded in any system. ESP8266 BOM is the only external resistors, capacitors, and crystal. The following data are based on a 3.3V power supply, ambient temperature 25C and use the internal regulator measured. All measurements are made in the absence of the SAW filter, the antenna interface is completed. all transmit data based on 90% duty cycle, continuous transmission mode in the measured. Storage controller contains ROM and SRAM. CPU can iBus, dBus and AHB interface to access the storage controller. Any one of these interfaces can apply for access to ROM or RAM cells, memory arbiter to determine the running order in the order of arrival. AHB module acts as arbiter, through the MAC, and SDIO host CPU control AHB interface. Since sending Address different, AHB data requests may arrive the following two slaves in one: APB module, or flash memory controller (usually in the case of off-line applications) to the received request is a high speed memory controllers often request, APB module receives register access is often Request. 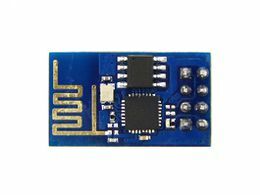 APB module acts as a decoder, but only you can access the ESP8266 main module programmable registers. Since the sending address different, APB request may reach the radio receiver, SI / SPI, hosts SDIO, GPIO, UART, real-time clock (RTC), MAC or digital baseband. Main Serial Interface (SI) can run at two, three, four-wire bus configuration, is used to control the EEPROM or other I2C / SPI devices. Multiple devices share the two-wire I2C bus. Multiple SPI devices to share the clock and data signals, and according to the chip select, each controlled by software alone GPIO pins. SPI can be used to control external devices, such as serial flash, audio CODEC or other slave devices, installation, effectively giving it three different pins, making it the standard master SPI device. SPI slave is used as the primary interface, giving SPI master and slave SPI support. In the built-in applications, SPI_EN0 is used as an enable signal, the role of external serial flash, download firmware and / or MIB data to baseband. In host-based applications, the firmware and you can choose one MIB data downloaded via the host interface both. This pin is active low when not should be left unconnected. SPI_EN1 often used for user applications, such as controlling the built-in applications or external audio codec sensor ADC. This pin is active low when not should be left unconnected. SPI_EN2 often used to control the EEPROM, storing individual data (individual data), such as MIB information, MAC address, and calibration data, or for general purposes. This pin is active low when not should be left unconnected. A total of up to 16 GPIO pins. The firmware can assign them different functions. Each GPIO can be configured internal pullup / pulldown resistors available software registers sampled input, triggering edge or level CPU interrupt input, trigger level wake-up interrupt input, open-drain or complementary push-pull output drivers, software register output source or sigma-delta PWM DAC. These pins are multiplexed with other functions, such as the main interface, UART, SI, Bluetooth co-existence and so on. Digital IO pad is two-way, three states. It includes a three-state control input and output buffers. In addition, for low-power operation, IO can be set to hold state. For example, when we reduce the chip's power consumption, all the output enable signal can be set to maintain a low-power state. Hold function can be selectively implanted IO in need. When the IO help internal and external circuit driving, hold function can be used to hold last state. Hold function to pin introduce some positive feedback. Therefore, the external drive pin must be stronger than the positive feedback. However, the required driving force size is still small, in the 5uA of. All digital IO pins must add an overvoltage protection circuit (snap back circuit) between the pin and ground. Usually bounce (snap back) voltage is about 6V, while maintaining the voltage is 5.8V. This prevents excessive voltage and generating ESD. Diodes also avoid reverse voltage output devices. With P2P discovery procedures, passive or active scanning once in the host command start, it will be done automatically. Perform power management, interaction with the host at least, this way, the task of effectively minimized. off (OFF): CHIP_PD pin is in a low power state. RTC failure. All registers are emptied. deep sleep (DEEP_SLEEP): RTC open, other parts of the chip are closed. RTC internal recovery memory to save the basic WiFi connection information. sleep (SLEEP): Only RTC running. Crystal oscillator stops. Any part of the wake (MAC, host, RTC timer, external interrupt) will make the wake of the chip. Wake (WAKEUP): In this state, the system from a sleep state to start (PWR) status. Crystal oscillator and PLL are converted enabled state. ￼￼* on state (ON): High-speed clock can run, And sent to each clock control register is enabled Modules. Each module, including the CPU, including the implementation of relatively low-level clock gating. When the system works, you can WAITI instructions to turn off the CPU's internal clock. ESP8266 on high frequency clock is used to drive two Tx and Rx mixer, which is generated by the internal oscillator and an external oscillator. Crystal frequency between 26MHz to 52MHz float. Although the internal crystal oscillator of the calibration range of the crystal so that the clock generator to meet the conditions, but in general, the crystal quality is still obtained a proper phase noise factors to be considered. When the crystal is used, or because of the frequency offset, rather than the best choice for quality, the maximum capacity of the data processing system and will reduce the sensitivity of the wifi. Please refer to the following instructions to measure the frequency offset. 2.4GHz RF signal receiver down into quadrature baseband signal, with two high-resolution, high-speed ADC and the latter into a digital signal. In order to accommodate different signal channels, a radio receiver integrated RF filters, automatic gain control (AGC), DC offset compensation circuit and a baseband filter. This will reduce the time and equipment required for testing. Clock generator contains a built-in calibration circuit and self-test circuitry. Clock phase and quadrature phase noise through the optimal calibration algorithm processing patent on the chip, in order to ensure that the receiver and transmitter to achieve the best performance. AT+CWQAP quit the AP wifi AT+CWQAP - AT+CWQAP=? AT+ CWSAP set the parameters of AP wifi AT+ CWSAP= <ssid>,<pwd>,<chl>, <ecn> AT+ CWSAP? ssid, pwd, chl = channel, ecn = encryption Connect to your router: ：AT+CWJAP="YOURSSID","helloworld"; and check if connected: AT+CWJAP? AT+ CIPSERVER set as server TCP/IP AT+ CIPSERVER= <mode>[,<port> ] mode 0 to close server mode, mode 1 to open; port = port turn on as a TCP server: AT+CIPSERVER=1,8888, check the self server IP address: AT+CIFSR=? There are multiple versions of the model, check the source where you bought the module.